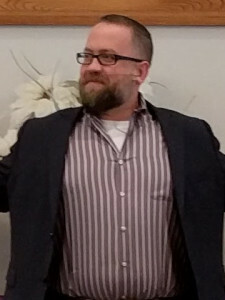 Pastor William “Will” Coley is a Licensed Minister in the Conservative Congregational Christian Conference and now calls Parkman Congregational Church home. Will earned a Masters in Religion, with a focus on the church’s responsibility to be role models of the faith, and a dual track Masters of Counseling in Mental Health and Family Therapy from Gordon-Conwell Theological Seminary. He earned his Bachelor of the Arts in Psychology from Bowling Green State University. He has served in various Youth Ministries since 2001, including Youth for Christ as a Regional Director and most recently Sovereign Grace Community Church as the Youth Director. Outside of the church, Will has also served in the Mental Health field since 1998. Will was a Mental Health Therapist for Lahey Health Behavioral Services before he accepted the position of Full Time Pastor here at Parkman Congregational Church. Will has a growing family. His wife is Karen and they have a daughter, Lydia, and a son, Nathaniel.